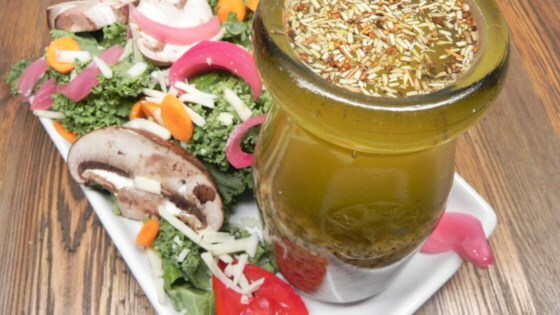 "This recipe makes a ton of dressing but may be scaled down to half. Plan ahead, as the dressing needs to chill for a few hours before serving. It will keep well in the refrigerator for up to 2 weeks. All ingredients may be adjusted to taste." Pour olive oil, 1/2 cup plus 2 tablespoons vinegar, Parmesan cheese, mustard, oregano, basil, onion, garlic, salt, sugar, and black pepper into a large glass jar. Whisk or stir with a spoon until well combined. Refrigerate dressing for at least 2 hours. Shake very well before serving. You can also blend this dressing in a processor or a blender.